Renal failure in diabetes is a common cause of renal replacement therapy. The affected kidney goes through various changes in all compartments progressively. 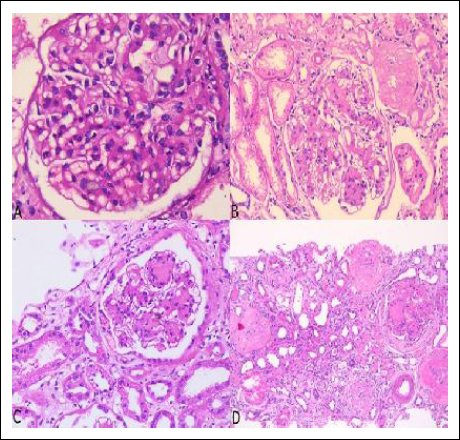 The classification of diabetic nephropathy is based on glomerular lesions and displays a heterogeneous morphology. Abnormalities in tubulointerstitial and vascular compartments are important in assessing the outcome of these patients. We applied the new pathologic classification of diabetic nephropathy by Tervaert et al to classify the renal damage in diabetes. This is a prospective study over two years. We analyzed 74 renal biopsies in diabetic patients, both type-1 and type-2. Indications for biopsy were rapid onset of proteinuria, absence of retinopathy, presence of hematuria, active urine sediment, and rapid unexplained deterioration of renal function. Biopsy was done to rule out nondiabetic renal disease or any other associated pathology with diabetic nephropathy. In our study, 53 patients were male and 21 patients were female. Age ranged from 27 to 82 years. The mean ± standard deviation age at the time of the biopsy was 54.09 ± 11.59 years. Mean duration of diabetes was 10.2 years. Proteinuria ranged from 1 to 26 g. Type-111 histopathological lesion was the most common lesion observed in our series. There was a correlation between the degree of tubulo-interstitial damage with renal function. There was no correlation between the fundal changes and degree of proteinuria with the histological class of diabetic nephropathy. Application of the classification by Tervaert et al to diabetic lesions reduces the inter-observer variability and also helps in prognosticating and management of patients. The prevalence of diabetes mellitus, especially type-2 diabetes, is rapidly increasing in the Asian population. Approximately 50% of diabetic patients develop proteinuria within 20 years of diabetes. Diabetes tends to affect a much younger age group among Asian population in comparison with Western population. Renal involvement with progression to end-stage renal disease is more common in Asian population in comparison with Western population., The classification of diabetic nephropathy is based on glomerular lesions and displays heterogeneous morphology. An accurate estimate of the amount of damage in the tubulo-interstitial compartment and type of glomerular lesions can be done by histological analysis of the tissue. The indications for renal biopsy in diabetes are rapid onset of proteinuria, absence of retinopathy, presence of hematuria, active urine sediment, and rapid unexplained deterioration of renal function to rule out nondiabetic causes of renal dysfunction. The aim of this study was to classify the renal lesions according to the classification proposed by Tervaert et al and correlate the histopathological features with clinical findings. This classification was based on changes in all the compartments of the renal biopsy. The material for this study is from the department of pathology in a tertiary care hospital which is a referral laboratory for renal biopsies. The indications for renal biopsy included proteinuria, rapidly deteriorating renal function, absence of retinopathy, and active urine sediment. Biopsy was also done to exclude nondiabetic renal disease or coexisting renal disease. Three biopsy cores were sampled for light microscopy (LM), immunoflourescence (IF), and electron microscopy (EM) study. LM and IF were done routinely and EM was done wherever deemed necessary. Biopsy was fixed in 10% buffered formalin for LM and 2% glutaraldehyde for EM study. Hematoxylin and eosin, periodic acid-Schiff, Massons Trichrome, and Jones silver stains were done on all biopsies. Immunofluorescence was done on frozen tissue with IgG, IgA, IgM, C3c, C1q, Kappa, and Lambda in all biopsies. The glomerular lesions were classified according to the classification of diabetic nephropathy proposed by Tervaert et al Tubulo-interstitial and vascular changes also were graded. Slides were reviewed by two pathologists with total concordance among the different classes. Inadequate biopsies were excluded from the study. A total of 74 diabetic patients with renal dysfunction underwent renal biopsy. This constituted 4.27% of the total number of renal biopsies studied over the two-year period. Seventy-two patients had type-2 diabetes and two patients had type-1 diabetes. Male-to-female ratio was 2.4:1. Age of the patients ranged from 27 to 82 years. The mean ± standard deviation age at the time of renal biopsy was 54.09 ± 11.59 years. Duration of diabetes ranged from six months to 18 years. Mean duration of diabetes in class IIA was 6.12 ± 4.16 years. Mean duration of diabetes in class IV lesions was 10.87 ± 4.67 years. Fundus examination was available in 61 patients. Fundoscopy done by ophthalomologist revealed normal fundus in 48 patients. Six patients had proliferative changes and five patients had nonproliferative changes on fundoscopy, which were confirmed by fluorescein angiography. One patient was on postretinopathy treatment and one patient had retinitis pigmentosa. Mean duration of diabetes in patients with diabetic nephropathy coexisting with retinopathy was 10.88 ± 4.42 years, whereas mean duration of diabetes in patients with only diabetic nephropathy was 9.125 ± 4.82 years. Glomerular lesions were classified according to the classification proposed by Tervaert et al. [Table 1]. In our series, the most common class was Class III constituting about 50% of all the lesions [Figure 1]. Table 1: Distribution of cases across different classes and the mean age of patients. Figure 1: (a) Glomerulus in Class IIA showing mild mesangial cellularity (H and E, × 200). (b) Glomerulus in Class IIB showing marked mesangial cellularity (H and E, × 100). (c) Glomerulus showing Kimmelstiel Wilson Lesion (H and E, × 100). (d) Advanced diabetic glomerulosclerosis (H and E, × 100). There were two cases of Class 1 diabetic nephropathy, who had near-normal renal biopsies, these were diagnosed on electron microscopy. The mean 24-h urinary protein levels were highest in Class IIB and were lowest in Class IV [Table 2]. 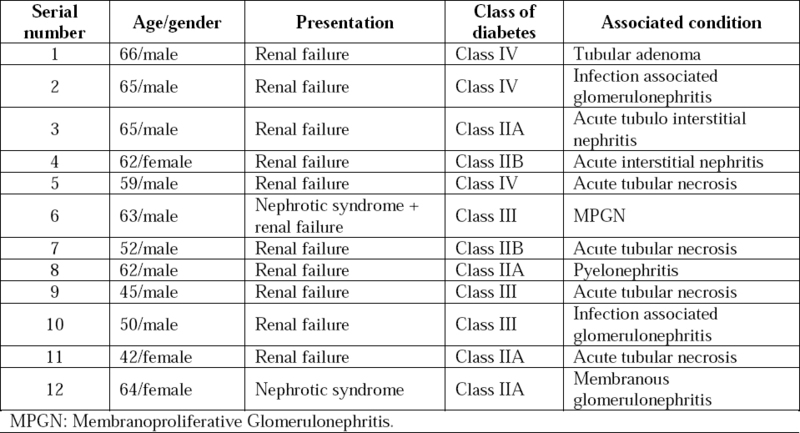 Table 2: Clinical and pathological details across different classes of diabetic nephropathy. The tubulo-interstitial and vascular changes were graded according to the same classification [Figure 2]. Figure 2: (a) Renal tissue showing interstitial fibrosis and tubular atrophy (Score 2) (Masson's Trichrome, × 40). (b) Interstitial fibrosis and tubular atrophy (Score 3) (Masson's Trichrome × 40). (c) Interstitial inflammation (Score 2) (H and E, × 100). (d) Arteriolar hyalinosis (Score 1) (H and E, × 200). The mean creatinine levels progressively increased from Class IIA to Class IV. This correlated with worsening interstitial fibrosis and tubular atrophy (IFTA) score. The vascular changes were more marked in III and IV classes [Table 2]. Twelve patients had other associated renal diseases. Infection-associated glomerulonephritis was the most common glomerular lesion associated with diabetic nephropathy in our series. Three patients had acute interstitial nephritis and two had acute tubular necrosis. One patient had an associated tubular adenoma [Figure 3]. The clinical and demographic details are given in [Table 3]. Table 3: Associated conditions with diabetic nephropathy. Figure 3: (a) Tubular adenoma associated with diabetic nephropathy (H and E, × 100). (b) Diabetes nephropathy with infection associated glomerulonephritis (H and E, × 100). (c) Acute pyelonephritis associated with diabetic nephropathy (H and E, × 100). (d) Acute interstitial nephritis (H and E, × 200). In our study, there was a poor correlation between mean proteinuria levels and diabetic renal changes. Fundal changes did not correlate with the renal changes. Duration of diabetes in Class II was significantly less than in Class IV lesions. Mean age of patients increased from Class I lesions to Class IV lesions. Diabetes mellitus is a growing health problem. Diabetic nephropathy is the most important long-term complication of diabetes. End-stage renal disease in type 2 diabetes is the most common cause of renal replacement therapy. Risk factors for diabetic nephropathy are (1) genetic predisposition, (2) glycemic control, and (3) blood pressure levels and smoking. Recent studies suggest that podocyte injury and reduction in cell density are the causes of development of diabetic nephropathy. The prevalence of diabetes has rapidly increased in Asian population due to change in lifestyle. The prevalence of diabetic nephropathy is also increasing because of increase in the prevalence of diabetes mellitus and better survival of patients with diabetes. Diabetic nephropathy is characterized by development of proteinuria and decline in glomerular filtration rate which occurs over 10–20 years. Diabetic nephropathy is divided into stages depending on the duration of the disease. Stage 1 is characterized by hyperfiltration without any renal disease. In Stage 2, morphological lesions develop without signs of clinical disease. Stage 3 is the development of albuminuria and Stage 4 is where overt nephropathy develops. A timely diagnosis of diabetes nephropathy is important to interrupt the natural course of disease and stop the progression of disease to end-stage renal disease. According to the current screening recommendations, once the presence of albumin is confirmed, a renal biopsy is indicated. Renal biopsy determines the extent of damage in diabetic nephropathy and also is useful in detecting renal disease other than diabetes. 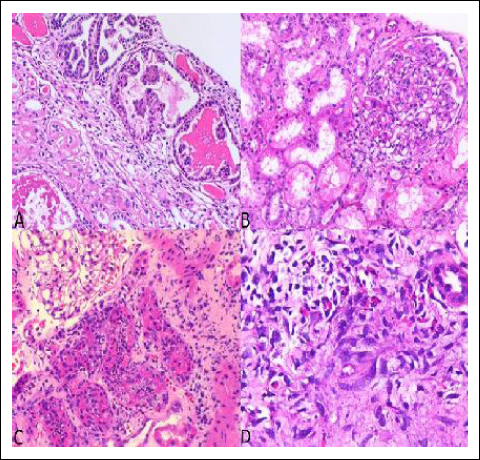 The histological lesions of diabetic nephropathy have a characteristic pattern that can be identified by LM and EM. Apart from changes in the glomeruli, abnormalities are found in the tubulointerstitial and vascular compartments. In 1959, Gellman et al first gave an overview of clinical correlation of renal biopsy findings. More recently, the histological patterns of diabetic nephropathy were described. Gambana et al and Fioretto et al described typical and atypical diabetic nephropathy and other diseases superimposed on diabetic nephropathy. Pathological classifications exist for several renal diseases; however, a uniform classification for diabetic nephropathy was lacking. A new classification was proposed by the Research Committee of Renal Pathology Society. In our study, we have used the classification proposed by Tervaert et al to categorize our lesions and also correlate the histological features with clinical and laboratory data. Diabetic nephropathy is classified as Class I - isolated glomerular basement membrane thickening, Class IIA - mild mesan- gial expansion, Class IIB - severe mesangial expansion, Class III - Kimmelstein Wilson lesion, at least one glomerulus should have nodular lesion and ClassIV - advanced diabetic glomerulosclerosis. Applying this classification to biopsies, the severity of IFTA correlated with the serum creatinine levels and to some extent with the duration of the disease. There was no correlation with the degree of proteinuria or with retinal changes. Vascular changes were more prominent in Class 3 and Class 4 lesions. We compared our findings with similar other studies in literature. According to Mazzuco et al, the frequency of Class III varied from 12% to 45%. In our study, Class III glomerular lesions were the most common, constituting about 50% of the lesions. Okada et al evaluated renal biopsies of 69 type-2 diabetic patients with proteinuria. They found that the glomerular lesions were not a significant independent variable but IFTA was associated with renal end point. Our study also showed similar findings. In a retrospective study by Mise et al, IFTA and interstitial inflammation had a strong impact on the renal prognosis. Absence of retinopathy is one of the indicators for biopsy in patients with renal disease associated with diabetes. In our study, fundus examination details were available in 61 patients and 48 patients had normal fundus findings. Retinal changes were seen in 19.6% of cases. In studies available in literature, fewer than 50% of the patients with overt diabetic nephropathy had retinopathy. Another major indication for renal biopsy is to identify superimposed nondiabetic renal disease over diabetic nephropathy. The occurrence is well recognized. A variety of renal diseases are described such as IgA nephropathy, membranous glomerulonephritis, focal segmental glomerulosclerosis, and hypertensive changes. In a review by Zhou et al, IgA nephropathy was the most common glomerular disease constituting about 14.1% of the cases. Postinfectious glomerulonephritis was seen in 10% of cases. Tubulointerstitial lesions were associated with 25.5% of the cases. In our study, the most common association was with tubulointerstitial lesions in 10.8% followed by postinfectious glomerulonephritis in 2.10% of cases. Renal biopsy is still the gold standard for diagnosis of diabetic nephropathy. Morphological changes in all the compartments should be graded according to a standardized histology protocol. Changes in each compartment have independent prognostic significance which helps the nephrologist to plan treatment protocols. Diabetic nephropathy is a leading cause of end-stage renal disease requiring renal replacement therapy. Like for other diseases, renal changes in diabetes are classified for better understanding and applying appropriate treatment protocols. There was no correlation of glomerular changes with duration of disease and proteinuria. IFTA correlated with increasing serum creatinine and duration of the disease. Progression of diabetic nephropathy is best correlated with the tubulo-interstitial and vascular changes. Mise K, Hoshino J, Ubara Y, et al. Renal prognosis a long time after renal biopsy on patients with diabetic nephropathy. Nephrol Dial Transplant 2014;29:109-18. Chan JC, Malik V, Jia W, et al. Diabetes in Asia: Epidemiology, risk factors, and pathophysiology. JAMA 2009;301:2129-40. Zhuo L, Ren W, Li W, Zou G, Lu J. Evaluation of renal biopsies in type 2 diabetic patients with kidney disease: A clinicopathological study of 216 cases. Int Urol Nephrol 2013;45: 173-9. Bakris GL, Williams M, Dworkin L, et al. Preserving renal function in adults with hypertension and diabetes: A consensus approach. National Kidney Foundation Hypertension and Diabetes Executive Committees Working Group. Am J Kidney Dis 2000;36:646-61. Jauregui A, Mintz DH, Mundel P, Fornoni A. Role of altered insulin signaling pathways in the pathogenesis of podocyte malfunction and microalbuminuria. Curr Opin Nephrol Hypertens 2009;18:539-45. Collins AJ, Foley RN, Herzog C. National, regional, and global trends in fasting plasma glucose and diabetes prevalence since 1980: Systematic analysis of health examination surveys and epidemiological studies with 370 country years and 2.7 million participants. Lancet 2011;378:31-40. Rabkin R. Diabetic nephropathy. Clin Cornerstone 2003;5:1-11. Papale M, Di Paolo S, Magistroni R, et al. Urine proteome analysis may allow noninvasive differential diagnosis of diabetic nephropathy. Diabetes Care 2010;33:2409-15. Tervaert TW, Mooyaart AL, Amann K, et al. Pathologic classification of diabetic nephropathy. J Am Soc Nephrol 2010;21:556-63. 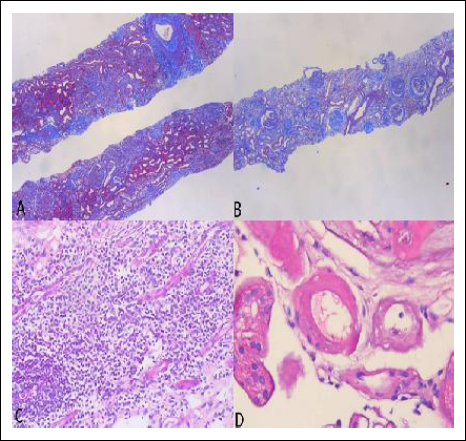 Tonolo G, Cherchi S. Tubulointerstitial disease in diabetic nephropathy. Int J Nephrol Renovasc Dis 2014;7:107-15.